Called the "world's sexiest" by travel guides in Europe, the aptly named Adam & Eve Hotel in Belek - Antalya, Turkey, is a case study in why minimalism is today's romanticism. 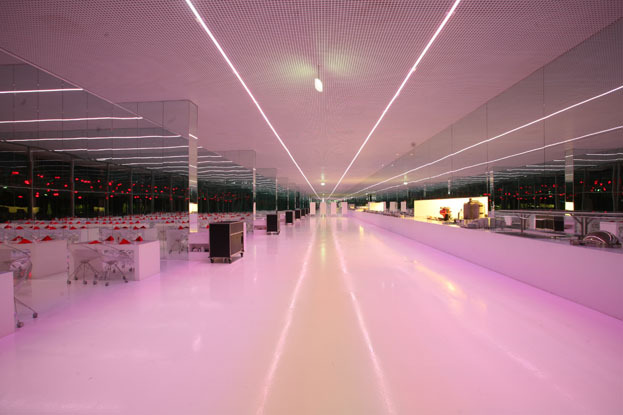 Using an apparently simple palette of materials in a range of soft, glossy whites, native architect Eren Talu produces a dazzling range of effects with colored lights, floor-to-ceiling mirrors and hidden sound systems. The interiors reflect and add counterpoint to the adjacent forest and Mediterranean coastline, creating an inner world of fantasy and modern luxury. Among the most prominent material choices are the Open Cell Ceiling systems by Hunter Douglas, visible everywhere from lounges and restaurants to pools and hallways. The light yet consistently geometrical lattice of the ceiling installations reinforces Talu's planning grid, which is unrelentingly modern and surprisingly rational, given the Garden of Eden theme. The backdrop of the ceiling adds texture while also concealing the lighting fixtures, audio systems and HVAC ducts that lend comfort to Talu's modern fantasy. While different in many important respects from Talu's earlier Antalya project, the Hillside Su Hotel, both hospitality venues on the so-called "Turkish Riviera" show the architect's predilection for minimalism, white hues and mirrors. The use of dramatic lighting effects also ties together the two works. At the Hillside Su, guests arrive under giant disco balls, but the Adam & Eve Hotel features a more gracious and roomy entrance lobby - a dazzling atrium of colored light and reflections. Centering on a large bar, the 10,000-square-meter central space features white sitting beds and a twinkling ceiling of hand-laid glass mosaic. (Each tile, it should be noted, is shaped as a disco ball.) The atrium lobby serves as the heart of the public zones, with access to numerous lounges and bars, nine restaurants and eight luxury shops. In other spaces, however, Talu's more refined and simple gestures - combined with the dramatic scale of the large rooms - make it the most luxurious modern spectacle on the Mediterranean. Most of the hotel's 500 or so guest rooms are located in a six-story rectangular block perpendicular to the coastline, each with an ample 16-meter terrace. Private villas, from large studios to townhouse-sized units, are also available in separate buildings, many covered with garden roofs and with easy access to private pool decks. Along the beach, Talu planted an orchard of 270 apple trees in a rectangular grid. 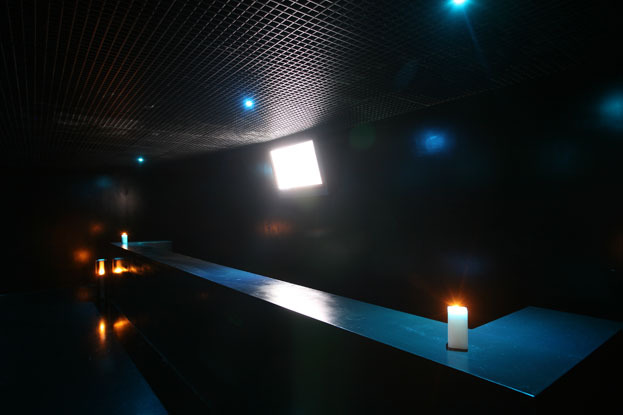 Inside, a full-service spa and other indulgences, including 13 Turkish baths, await guests. For anyone choosing to conduct business in this veritable Eden, the Adam & Eve Hotel offers fully equipped conference and meeting rooms, too. The 64-square-meter guestrooms are a study in architectural integration for the pursuit of pleasure. 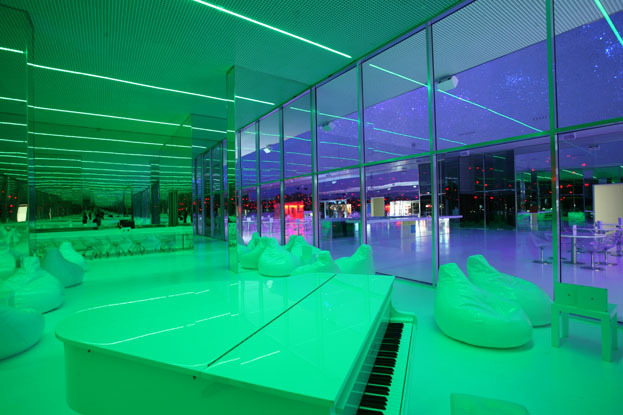 Concealed color, light and sound systems are designed for therapeutic and mood effect, and though complex, can be adjusted easily. In addition to the king-size bed and the requisite hot tub with built-in sound and lighting, there's an in-room offering of gourmet treats and luxury goods that goes far beyond those in a standard mini-bar (a term that hardly seems to apply in this case). Guests lucky enough to stay in the Adam & Eve Suite can dance and relax in a private lounge complete with its own DJ booth. Talu lavished the public areas with refined architectural detailing and a unique selection of the latest finishes and furnishings. Among the highlights:a piano lounge with white faux-leather beanbag chairs, chairs on casters, and slick white resilient floor. 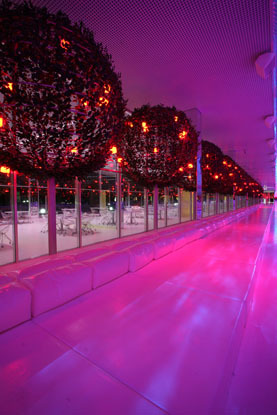 Above, narrow linear lighting fixtures are embedded in the Open Cell Ceilings; a dark bar with a long, narrow counter. 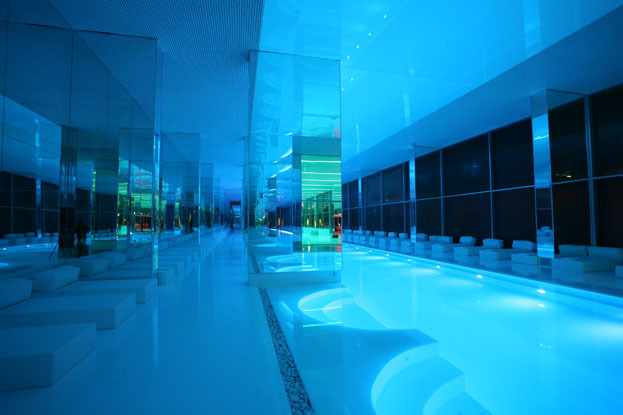 Highlighting the all-black, dimly illuminated space are blue pin spots and grazing fixtures that pick up the grid and texture of the ceiling; the indoor pool, with mirrored walls and white day beds lining the water. Seating areas and stairs curve out from one side of the rectangular pool, providing relief from Talu's otherwise orthogonal floor plans; a long, narrow lounge with white leather banquettes and white floor. Here, Talu brings his apple trees indoors by adding spheres of artificial leaves to the circular columns along a glass wall. 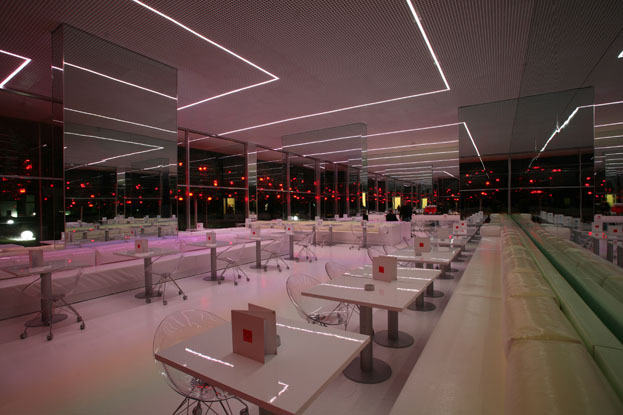 The Open Cell Ceiling serves as a neutral backdrop, talking on the colored lighting and reinforcing the linearity of the space; several restaurants with more slick white upholstery and linear white ceiling lights. Adding fun and convenience, Talu favors clear plastic chairs on casters for the several foodservice and lounge areas. 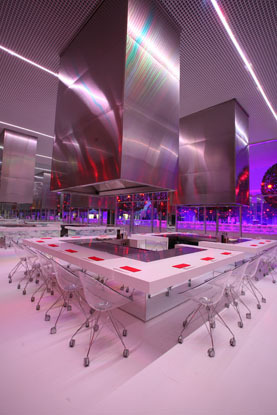 One hibachi-style setting features classic U-shaped grill tables in white solid surfacing on a mirrored base, with impressive stainless-steel exhaust stacks. In some cases, Talu's vocabulary takes on an otherworldly, futuristic feeling. And as the multitude of mirrored walls suggests, this hotel is as much about being seen as it is about pampering oneself. Fortunately the soft color palette and engineered sound system create an engaging backdrop that leaves room for intimacy. Talu's flair for drama and careful detailing are what make the Adam & Eve Hotel a new "must-visit" for world travelers.